Total earnings for the S&P 500 index are expected to be up +17.6% in Q3 from the same period last year on +7.3% higher revenues, the 6th time in the last 7 quarters of double-digit earnings growth. Q3 earnings growth is expected to be in double-digits territory for 10 of the 16 Zacks sectors, with Energy, Finance, Construction, Basic Materials and Technology sectors with the strongest growth, and Conglomerates and Autos expected to experience modest earnings declines. Estimates for Q3 came down as the quarter got underway, in contrast to the positive revisions trend that we have been experiencing in the comparable periods of the last three earnings seasons. This revisions trend is in-line with the long-run historical trend (beyond the last three quarters). 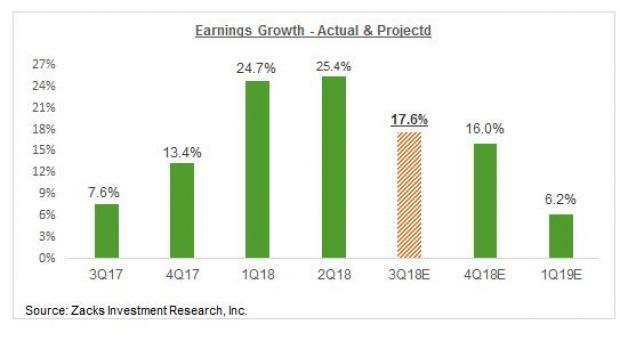 Growth in Q2 reached its highest level since 2010 at +25.4% earnings growth on +9.8% revenue gains, eclipsing the pace set in 2018 Q1. For the small-cap S&P 600 index, total Q3 earnings are expected to be up +21.5% from the same period last year on +7.6% higher revenues. This would follow +31.7% earnings growth on +8.9% revenue growth in 2018 Q2. For full-year 2018, total earnings for the S&P 500 index are expected to be up +20.7% on +6.7% higher revenues. For full-year 2019, total earnings are expected to be up +9.7% on +5.1% higher revenues. The implied ‘EPS’ for the index, calculated using current 2018 P/E of 18.4X and index close, as of September 18th, is $157.74. Using the same methodology, the index ‘EPS’ works out to $173.10 for2019 (P/E of 16.8X). The multiples for 2018 and 2019 have been calculated using the index’s total market cap and aggregate bottom-up earnings for each year. The tax cuts have proved a major boot to corporate profitability, but the earnings picture was fairly robust even before the tax reform took effect. The estimate revisions trend shifted over the preceding three quarters from negative to positive as another by product of the tax-law change. But this effect has started wearing off already, with estimates for the current period (2018 Q3) coming down since the quarter got underway, as the chart below shows. Estimates have come down for 13 of the 16 Zacks sectors, with Staples, Discretionary, Conglomerates, Autos and Business Services experiencing relatively more notable negative revisions. Of the two largest earnings contributors to the S&P 500 index, Technology and Finance, estimates have come down for the Finance sector while Tech sector estimates have modestly gone up. The positive revisions trend for the Tech sector isn’t across the board, with some major players like Apple (AAPL) and Alphabet (GOOGL) experiencing positive estimate revisions while others like Facebook (FB) experiencing estimates cuts. 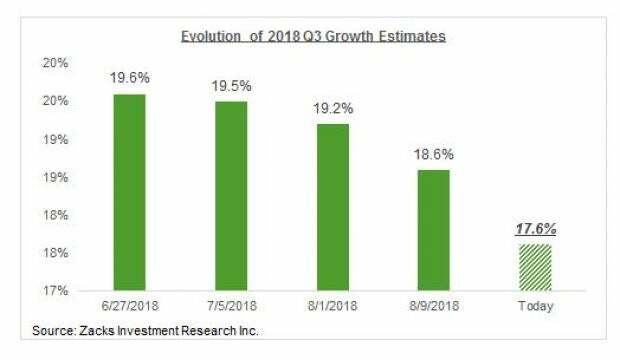 The chart below shows the expected Q3 earnings growth pace for the index in the context where growth has been in recent quarters and what is expected to come in the following few quarters. As you can see, the growth picture remains very strong, even though it is expected to decelerate in the current and coming quarters. But more important than the growth rate is the revisions trend, which reversed course after staying broadly positive over the last three quarters. Given the ongoing strength in the U.S. dollar, questions about the global economy and all-around trade uncertainty, it is possible that estimates for Q3 and beyond continue coming down in the coming days.